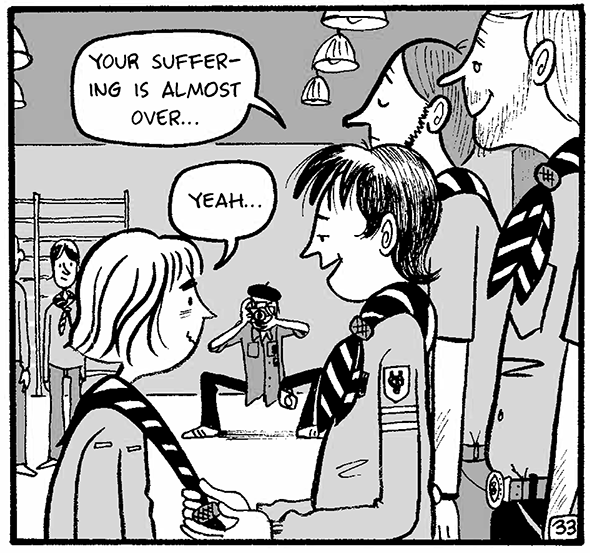 Michel Rabagliati’s cartoon memoirs: Paul Joins the Scouts and the Paul books, reviewed. 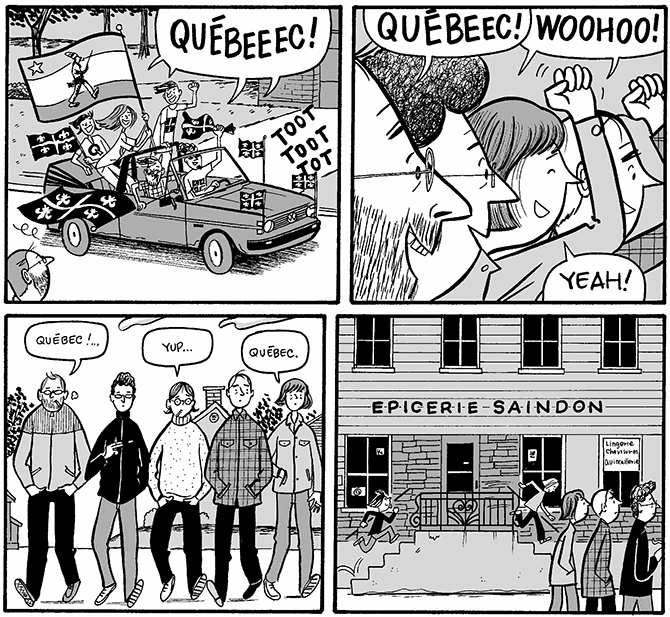 … is an ordinary, middle-class Quebecer who draws comics. Michel Rabagliati has not led an extraordinary life. He grew up in Quebec in the 1960s and 1970s. His parents loved him and each other. He was a Scout and, later, a camp counselor. He ran away from home once as a teenager but returned, embarrassed, later that night. Eventually he dropped out of high school. As an adult, he married, had a child, and worked for years as a commercial illustrator before changing careers midstream. And he doesn’t have an extraordinary personality. He has flashes of temper but seems like a caring husband and father. He enjoys Anglophone and Francophone pop music. He has a tendency to spend a little too much money on computer equipment. He is bad at cards. So why is he my favorite memoirist? Why do I look forward to his books even more than I do books by masters of personal narrative like Alison Bechdel or Tobias Wolff or Mary Karr? Since he started publishing comics in 1999, Rabagliati has written five full-length cartoon memoirs, all translated from the French by Helge Dascher, all published in English by small Canadian presses, each a tale of a discrete period of his ordinary life—a summer job at age 18, the struggle to conceive as a thirtysomething married couple, the death of a parent. Reading Rabagliati’s wonderful new book, Paul Joins the Scouts, I started thinking about what it is about his work that so draws me in. (The book is one of 10 nominated for this year’s Cartoon Studio Prize, awarded by the Slate Book Review and the Center for Cartoon Studies.) Like all memoirs, Rabagliati’s books are particular to one person’s unique experience. But as very few memoirs do, they make me look inside my own experiences to find the emotional congruencies between my life and his. Paul Joins the Scouts is set in 1969 and 1970 as Rabagliati’s alter ego Paul, nearing 10 and eager to fit in, joins his local troop of Baden-Powell scouts. (Long popular in England and Canada, but only recently appearing in the United States, the Baden-Powell scouting movement emphasizes outdoorsmanship over other traditional aspects of scouting, like neighborhood activities and crafts.) Over two summers, two three-week camping trips up north challenge Paul’s sense of himself, bond him tightly to his troopmates, and force him to face the fears and sadnesses of young manhood. It’s deeply square subject matter, I mean to say, starring a deeply square hero (cool throwback Expos T-shirt notwithstanding). In other Paul books, we meet teenage Paul, who’s rebellious and angry, and twentysomething Paul, who’s confused and often at sea. But 9-year-old Paul is a sweet kid, one who loves his parents and wants only to fly a kite and make friends and kiss a girl. Though he’s shy at first, he blooms in the sunshine of scouting. There’s no winking irony or looming cynicism in the book’s presentation of the scouting experience; for Paul, it’s a wonderful rite of passage, a fond memory of brotherhood, gentle leadership, and found courage. The men who serve as Paul’s scoutmasters are universally good-hearted and free of duplicity—in one imagined scene, one even expresses disappointment in his boyfriend when the boyfriend leeringly ascribes ulterior motives to his work as a scoutmaster. 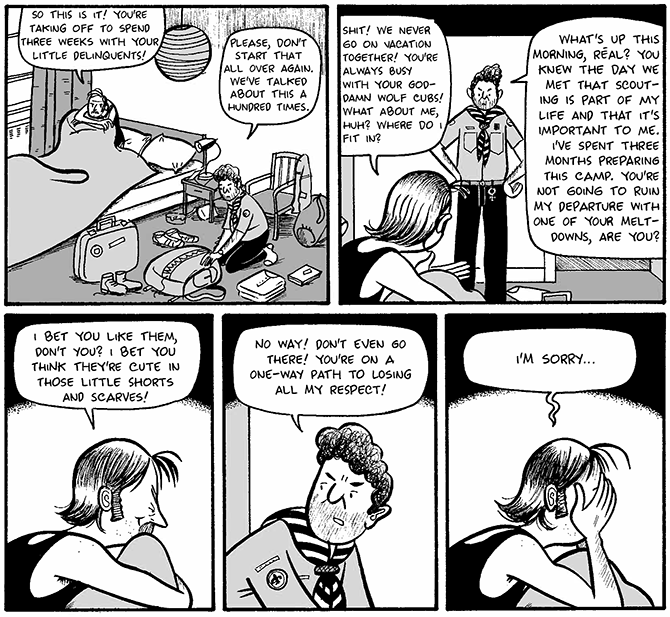 That’s not to say there isn’t darkness in Rabagliati’s work; indeed, many of the books feature unspeakable tragedies, including Paul Joins the Scouts. But Rabagliati’s measured, calm observational storytelling makes those dark moments feel like part of the fabric of a person’s life—they are universal traumas that we all experience, and I feel lucky to have someone as thoughtful as Rabagliati depicting them. Rabagliati’s previous memoir, The Song of Roland, starts out as the story of Paul’s caring relationship with his rambunctious Quebec City in-laws, and evolves into the tale of Paul’s wife, Lucie, and her two sisters seeing their father through the difficult process of dying of cancer. Whole sections go by without Paul appearing at all, but as I’d come to know and value this whole family, I didn’t miss him—or rather, I felt that he has become an important part of this family even when he’s not present. I felt as though I’d become a part of the family, too. All the books contain these kinds of gentle narrative left turns, moments when, as in real life, unexpected events turn one kind of story into another. Formally, Rabagliati’s an innovative storyteller, willing to take risks, to leap forward and backward in time, to break the narrative wall when necessary, and to cede the stage to other storytellers when appropriate. My favorite of the Paul books is Paul Goes Fishing, in which Paul and Lucie head up north to a lake cottage for a two-week vacation with Lucie’s sister Monique and her family. Much of the book is made up of light outdoorsy comedy, as fishing-averse Paul negotiates a campsite full of angling fanatics. But plumb in the middle of the book, Monique, a social worker, tells Paul a long, emotional story—drawn sensitively by Rabagliati—of a 3-year-old boy whose mother has “flipped her lid,” and whom Monique wants to adopt. She springs the boy on her husband; they have a terrible fight; Monique returns the boy to foster care, before realizing what a difficult position she put her family in. It’s a touching and complicated episode, an exploration of how wanting to do the right thing isn’t always enough, and how sometimes even “the right thing” is a product of our own selfish needs and desires. It also falls in the middle of a book that slowly reveals itself to be an exploration of the social and biological urge to procreate, to build a family: Paul and Lucie are at the age when everyone they know, including them, is trying to get pregnant, but with varying degrees of success and frustration. As I watched Paul and Lucie struggle with their own fertility troubles, I felt as a reader remarkably protective of them, and of my own emotions. I knew, from reading other Paul books, that one day there would be a child, but I didn’t know how or when that child would come, and I was desperate for these two people to find their future together. Now, my emotional response to Rabagliati’s stories is informed by the fact that his life milestones track mine fairly well: Happy childhood, unhappy adolescence, domestically settled 20s, kid-centric 30s, encroaching middle age clouded by parental health problems. 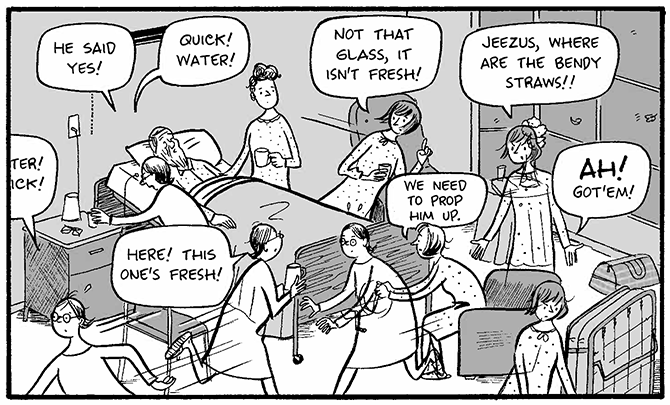 But it’s not just in Paul’s similarities to me that I find pleasure in Rabagliati’s books. His cartooning, always sharp and energetic—those years as a commercial illustrator gave his first books a great deal more visual polish than most cartoonists’—has nevertheless evolved over the past 15 years to become significantly more sophisticated and detailed. And Rabagliati’s a whiz at endings, a talent few writers in any medium can claim. All of his books have five-star endings, gentle and thoughtful final scenes that recontextualize the stories we’ve just experienced, helping readers see them in a new light. Many of the books have longueurs or scenes that don’t quite land, but the effect of these beautiful endings is always to send me out of the book feeling the joyful thrill of great populist storytelling. I’m also infatuated with the unique locale of the Paul stories—Quebec, a place I’ve visited only briefly, but which feels familiar and alien at the same time. The books’ clarity about the unique challenges and pleasures of living in that Francophone province no doubt contribute to Paul’s popularity in Canada. (Want a Paul chocolate bar? Buy one at the Comptoir du Chocolat in Saint-Lambert. Want to watch a Paul movie? Coming soon, reportedly, starring Quebecois TV star François Létourneau.) I’m not Canadian, but I love the precision of the Paul books’ setting: the Catholic-inspired curse words; the generational and political strife; the interplay between the near-European, progressive cities and the broad wilderness surrounding them. Paul Joins the Scouts takes place against the backdrop of Quebec’s “October crisis” of 1970, when Quebec separatists’ campaign of violence expanded to include kidnapping and murder. One of Paul’s scoutmasters gets embroiled in the struggle, and the boys in his troop watch the adults in their lives consumed by concern and debate about the future of their home. Considered collectively, the Paul books function as a sort of shadow history of a place over the past 50 or so years, and that specificity contributes to the books’ emotional authenticity. The people in Paul’s life are deeply connected to the place they live, and their complex love for that place makes me love them more. Yes, it’s utter and unconflicted love I feel for these characters, in a way that testifies to Rabagliati’s strengths as a storyteller. He portrays his characters truthfully but with no desire to undercut them. His characters are kind to each other, in the way that good families are, and he’s an expert at putting readers on their side. In the parlance of the day, they’re likable—realistically likable, in a way that helps me, the reader, identify and foster the likable parts of myself. Paul is cautious and nervous about doing this thing for a little girl who means a great deal to him—“I’m not great at describing things,” he says. But of course the description he offers is magical. We later see that very view, in one of those touching real-world photographs at the end of the book, and his description does it justice—he helps her see the world through his eyes, helps her feel something she otherwise couldn’t know. 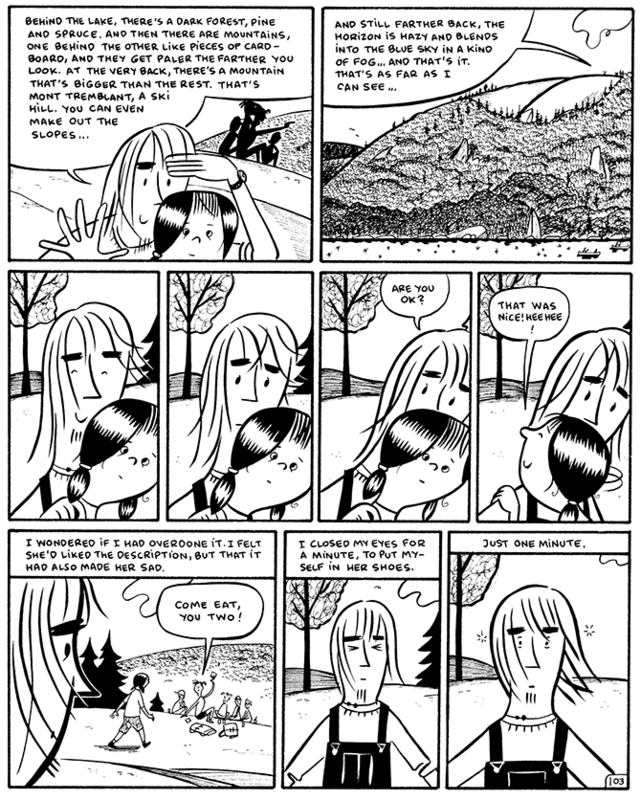 Through his 15 years of autobiographical comics, Michel Rabagliati has been doing the same thing for me. Let him tell you what he sees. Paul Has a Summer Job. Drawn and Quarterly. Paul Moves Out. Drawn and Quarterly. Paul Goes Fishing. Drawn and Quarterly. The Song of Roland. Conundrum Press. Paul Joins the Scouts. Conundrum Press.